The F200 Series meets the needs of self employed electricians and small and medium-sized business and industries in the electrical sector. 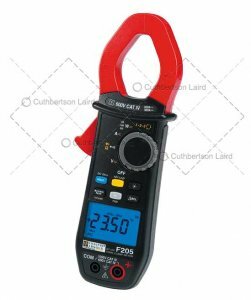 The F200 clamps are ideal for low-power or medium-power low-voltage applications: maintenance of tertiary or industrial electrical installations or installed machines, power supply diagnostics and / or sizing, commissioning of air-conditioning and heating systems, work on electric vehicles, etc. With a fast 12-bit TRMS digital acquisition system, F205 clamps offer particularly accurate measurements. Due to their large bandwidth and high crest factor, these clamps guarantee accurate measurements whatever the type of signal. Acquisition method: TRMS AC, (AC+DC) / DC. A AC: 0.15 to 600A (900A peak). A DC: 0.15 to 900A peak. V AC: 0.15 to 1,000V (1,400V peak). V DC: 0.15 to 1,400V. Automatic AC / DC detection: YES. Phase rotation (2-wire method): YES. Diode test (semiconductor junction): YES. Electrical safety as per IEC 61010: 1000V CAT IV & CAT III. Dimensions: 78 x 222 x 42 mm. Chauvin F205 Warranty: 1 year.